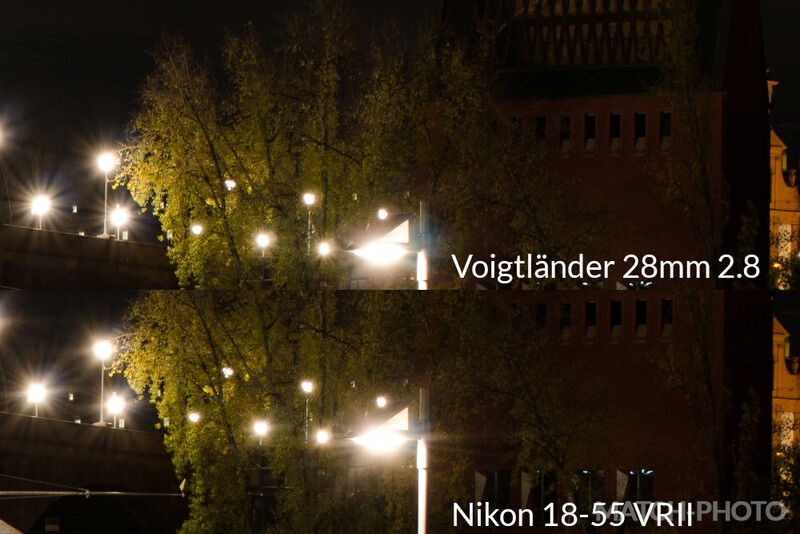 Lets compare the Voigtländer 28mm f2.8 and the Nikon 18-55 VR II. There are very few sources of information on the little Voigtländer. The people who own the lens praise its rendering of color and depth. I was intrigued by the small form factor and supposedly supreme image quality. Thats why I had been looking for one for quite some time. I finally found one in good condition and now I want to see what is what and if this lens is worth the extra money compared to the 18-55 VR II Nikkor lens that I fell in love with recently. Lets jump right into comparing the two when shooting a night scene. 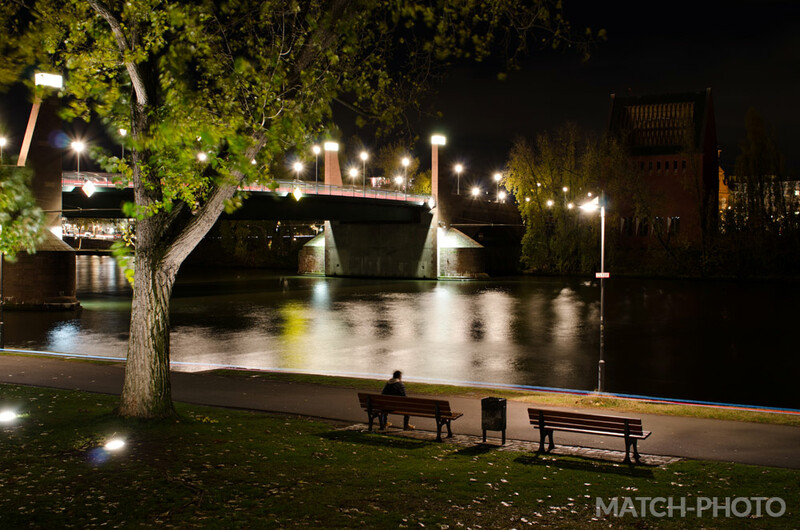 Night scenes are tough on lenses because they contain many dark areas which show even the slightest differences in shadow detail and microcontrast. Another point im curious about is color rendering and saturation. 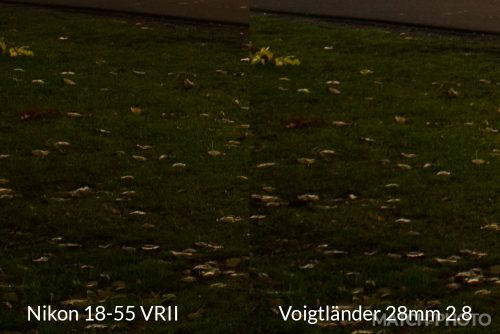 At first there aren’t much differences to see in these type of comparisons which just shows how great even todays cheapest lenses are (Nikon 18-55 VRII). But once you look closer you should be able to spot some differences. The most obvious difference is the way the lenses render the star around the streetlamps („sunstars“). Sunstars help your images convey a sense of how strong a lightsource really was. They are most often seen when photographing the sun (hence the name). The Nikon sunstars look soft and muted whereas the Voigtländer renders its stars stronger and more defined. This is a subjective thing but I prefer the way the Voigtländer 28mm renders its sunstars. If you’re having trouble spotting the differences I recommend to open the above two images in a new tab each and alternate between them. The next thing to look out for is shadow detail. The best place to make a judgement in the above image is the big bridge pillar in the middle of the frame. Above the waterline you can see some white marks on the stones in the shadow under the bridge. These marks are more pronounced and stand out more in the Voigtländer image, giving the impression of better detail/sharpness even though we can not see sharpness differences at these small magnifications (1000px wide). The above section is perfect for judging color saturation. What I notice is that the Voigtländer has slighty higher color saturation and the bumps in the grass are more pronounced. This results from a stronger shading of the darker parts and is a result of higher microcontrast. 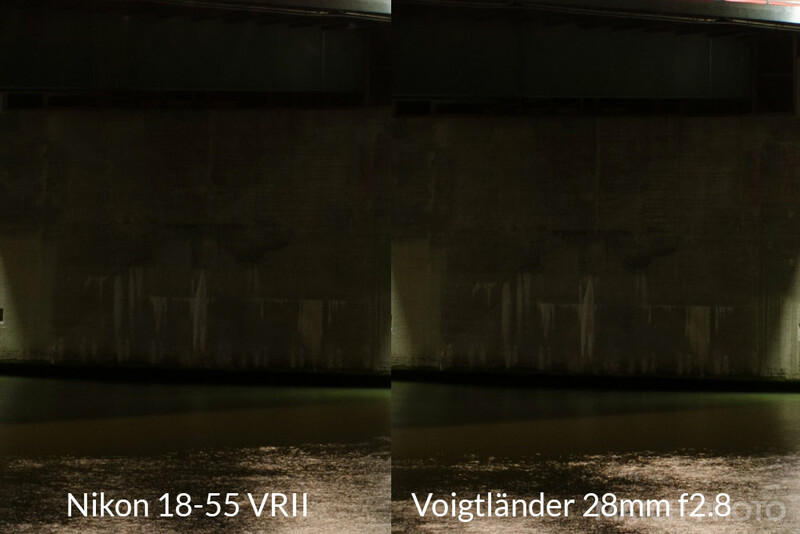 This means that local brightness differences are stronger with the Voigtländer giving a better feeling of depth and definition. In the above comparison (click the image for higher resolution) we can see the differences in micro-contrast. The Voigtländer again shines in this comparison. If you look at the trees in the left half of the image you can see the bright parts of the trees illuminated by the street lights shine brighter and seperate themselves stronger from the environment in the Voigtländer shot than in the Nikon 18-55 shot. The higher saturation of the Voigtländer 28mm 2.8 further helps with making its image feel more alive / convey a greater sense of depth. 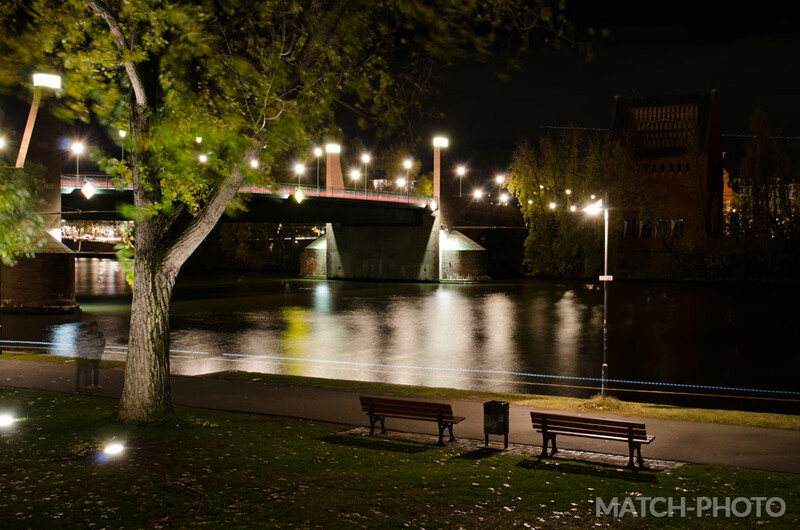 This has nothing to do with exposure, since the image brightness overall is identical. We can also see another example of the higher shadow detail of the Voigtländer. If you look at the tree in front of the right side of the big dark building you can barely see any detail in the Nikon shot, whereas the tree is clearly defined in the Voigtländer shot. This is due to better micro-contrast and not because of sharpness differences (the comparison shows about 50% resolution which means sharpness differences are hardly noticable). 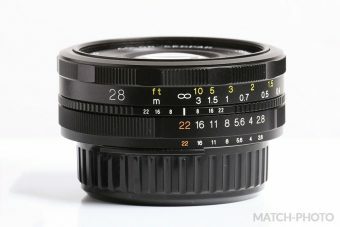 The Voigtländer 28mm 2.8 for Nikon is a step up from the basic Nikon kit lens. Wether this step up in image quality is worth it depends on your needs. While the Voigtländer is strong in rendering micro-contrast, the Nikon kit lens delivers great results and offers more flexibility (zooming and VR). For me using the Voigtländer was a great experience but I moved on since then. I highly value the benefits of vibration reduction for low light shooting and I find the ability to zoom very important in landscape photography.